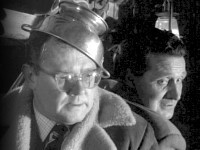 Steed and Emma zoom off on a motorcycle, with Steed tucked safely inside a sidecar. An obscure university archivist exposed to one too many theses decides to tinker with future history by murdering a key politician involved in uniting Europe. Our heroes catch up with him at Saint Bodes, and when the mastermind himself suddenly winds up dead, it becomes apparent that some of the students are in on the plot. While the premise is promising, the results proved to be somewhat less than memorable, save for the fancy dress party wherein Emma makes a smashing Robin Hood. The dialog fails to keep the plot moving, Richard Carlyon camping out in the woods makes little sense, and the scenes with the university students just scream "sixties!" Stephen Brooke of Canberra, Australia, reports that "I kept noticing that when any of the characters said St Bodes, their mouths seemed to say St Bedes. Closer inspection during one of the scenes in the college archive showed that the name of the college on one of the theses was indeed St Bedes. After a quick bit of surfing I found out that St Bedes is in fact a real school in Britain that has been around for a wee while—since before The Avengers, anyway. I suppose that is why they overdubbed St Bedes with St Bodes. Any resemblance to characters, living or... you know the score." 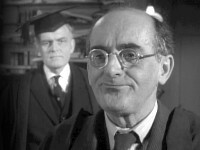 Nigel Stock appeared in the Police Surgeon episode, "Wilful Neglect." The Royal Masonic Senior School (which later became Bushey International University) served as Saint Bode's, and also appeared as the conference center in "Death's Door." On Location features a recent view. 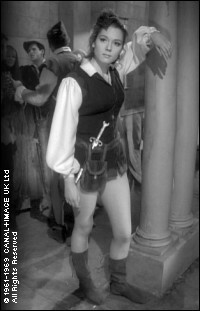 Strictly for the gents: Emma Peel as Robin Hood. And for the ladies: When confronted by Duboys and his boys, there is no question Steed is a man of nerve, skill, strength, and supreme self-confidence. Discussing Steed's sword at the costume party, Emma observes: "That looks a bit droopy." To which Steed responds: "Wait until it's challenged." No sexual overtones here, boys and girls. 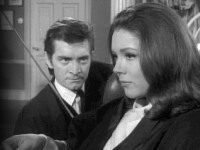 Dr. Henge is extolling the extensive university archives and is about to enumerate its contents when Steed finishes for him with "—an awful lot of theses."